Mobile is revolutionizing food culture, from soup to Korean Tacos. And we’re not just talking about tweeted photos of pork flavored ice cream. Mobile is the social location-based foundation of the “food truck economy;” of celebrity chef tutorials and recipes on your iPad; and of meal planning apps that impact what moms put on the table. The smartphone is now a part of everyone’s diet. We are democratizing once haughty meals with photo sharing, creating opportunities for entrepreneur chefs in need of real estate, and driving diners to previously uncharted 5-star dives. And society is only on the first course. Mobile and tablet adoption have passed the tipping point, and the table is set to dramatically change how/where/what we eat. Devices impact the taste buds and waistlines of our country, and our appetite for fresh, local foods. 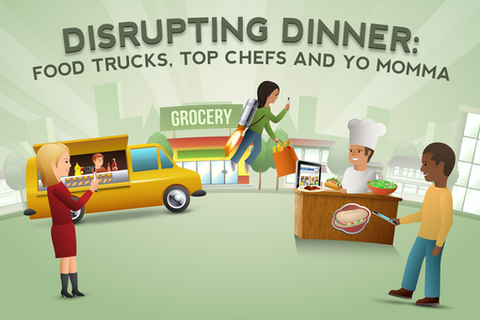 Disrupting Dinner goes in-depth to examine how we cook, shop, and dine out according to what our phones tell us. Nic Patrizi is the chef and owner of the Jalopy in Austin TX. His restaurant is a top Food truck in town, has been highlighted in several publications, and featured on the Food Network Channel. Opened for 2 years, the Jalopy has grown a large grass roots following, and has led to Nic rolling out a second restaurant concept opening in April. Nic is a graduate of the McCombs School of Business at The University of Texas with a degree in Finance; he now makes sandwiches and does dishes for living. Russ Parsons is the food editor and columnist of the Los Angeles Times. He has been writing about food for more than 25 years, including more than 20 years at The Times. He is the author of the cookbooks "How to Read a French Fry" and "How to Pick a Peach". In 2008 he was inducted into the James Beard Foundation’s Who’s Who of Food and Beverage, the hall of fame of American cooking. He has won many food journalism awards, including those from the International Association of Culinary Professionals, the Association of Food Journalists and the James Beard Foundation. "How to Read a French Fry" was a finalist for two Julia Child cookbook awards. “How to Pick a Peach,” which was published in 2007, was named one of the best 100 books of the year by both Publisher’s Weekly and Amazon. Before coming to The Times, he worked at the Los Angeles Herald Examiner, Albuquerque Tribune and Lubbock Avalanche-Journal.Parsons has been a journalist for more than 30 years, covering everything from high school football and professional rodeo to cops and courts and country music. Veteran entrepreneur Todd Dipaola co-founded inMarket in 2010 to bring the performance and accountability of online marketing to physical brands and retailers. inMarket's platform, including apps such as CheckPoints, List Ease, and Extra Extra, reach consumers on their smartphones as they made critical purchase decisions. In 2011, inMarket announced the world's largest mobile shopper network reaching over 20 million consumers. Under Todd's leadership inMarket has partnered with brands including Mondelez, Coca-Cola, Procter & Gamble, and Unilever, among others. Todd previously co-founded and bootstrapped digital marketing agency Vantage Media at the inception of search advertising. When Todd exited Vantage in 2007, it ranked 31 on the Inc 500 and earned "The Fastest Growing Technology Company in Los Angeles" honors by Deloitte's Fast50. Todd has a degree in Molecular and Cell Biology from UC Berkeley, where he was a Regents’ Scholar.